NewJerseyHauntedHouses.com recently sat down with Kathryn Wright of Haunted Barn & Spooky Hay Rides at South Jersey Pumpkin Show, to discuss what's new at Haunted Barn & Spooky Hay Rides at South Jersey Pumpkin Show for the 2017 Halloween Season! 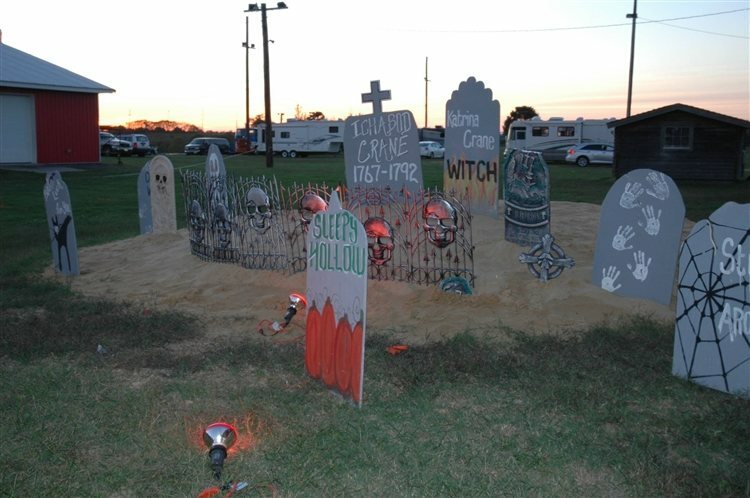 Located in Woodstown, the South Jersey Pumpkin Show will be celebrating its 14th year this year and is looking forward to giving families another season full of seasonal and spooky entertainment! What's new at Haunted Barn & Spooky Hay Rides at South Jersey Pumpkin Show for 2017? Do you have any new rides, attractions, or special features that Haunt Seekers should know about? Fall Festival of Trees, table top to 7ft tall Halloween, Fall & Thanksgiving decorated trees. Exhibit on display, over $500 in prizes. Tree lighting at 7:30pm on Friday, at the show, Oct. 13, 2017. Pro Pumpkin carver to sculptor a 500 to 900 pound Pumpkin. Ask questions, get tips and watch a masterpiece be creator. Headless Horsemen story and arrival at the Pumpkin Show on opening night. Two performances. Pumpkins, fall festival foods and great music! What differentiates Haunted Barn & Spooky Hay Rides at South Jersey Pumpkin Show from other local haunts in New Jersey? Affordable, pet friendly, safe, free pumpkins to first 200 kids each day, free treat bags, everything created at the Pumpkin Show is fun for the whole family. Tons of decorations and home décor. Families gather at the festival and spend hours. How long has Haunted Barn & Spooky Hay Rides at South Jersey Pumpkin Show been in business? Can you tell us a bit more about Haunted Barn & Spooky Hay Rides at South Jersey Pumpkin Show's history? 2017 marks our 14th annual event. Kathy Wright, Beau Wright, sons and family created the South Jersey Pumpkin Show back in 2003 out of the love of Fall and Pumpkins. Wanted to create an event where families can gather, enjoy all of fall's blessings and make lasting memories! What's your favorite experience since opening Haunted Barn & Spooky Hay Rides at South Jersey Pumpkin Show? The thousands of families that tell us how much they love the decorations, the contests, the craftsmen and come back all three days. The pumpkin dessert baking contest and free sampling is one of my favorite contests. I love judging the entries. How long is a typical haunt experience at Haunted Barn & Spooky Hay Rides at South Jersey Pumpkin Show from start to finish? Hayrides around the fairgrounds take about 10 minutes. 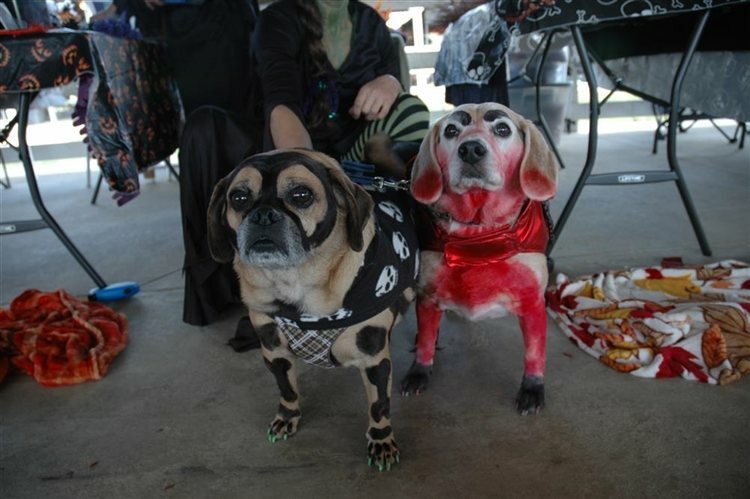 Trick or Treat stroll about 1 hour, Costume Dog Parade and Show are both one hour and the Pumpkin Pageant is an hour and a half. On a scale from 1 to 10, how scary would you say Haunted Barn & Spooky Hay Rides at South Jersey Pumpkin Show is? Why? 2, we keep everything kids and grandma safe at the festival. Tons of Halloween Inflatables. Does Haunted Barn & Spooky Hay Rides at South Jersey Pumpkin Show's property have any real haunted history? Do you have a spooky encounter you'd like to share? No, thank goodness. It gets really dark at the fairgrounds when the sun goes down. Marketing, promoting, organizing, creating and bringing it all together every year the second weekend in October. How has new technology (i.e. 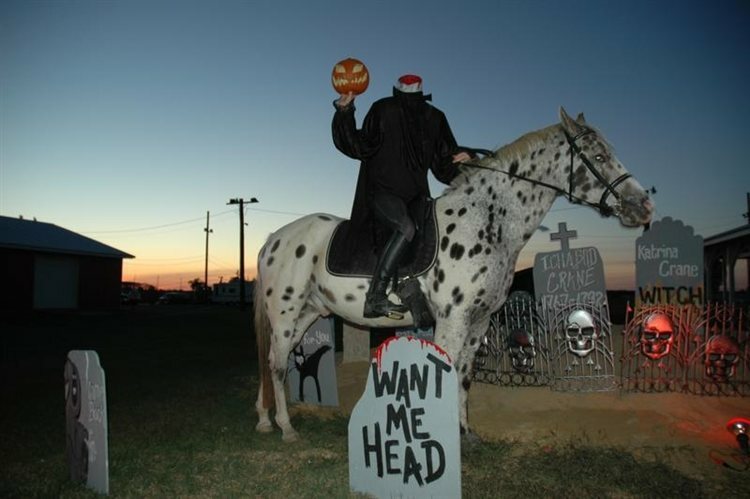 animatronics, special props, etc) helped you to enhance Haunted Barn & Spooky Hay Rides at South Jersey Pumpkin Show? Every year we purchase Halloween Animatronics from Spirit of Halloween. Always changing things up. Can Haunted Barn & Spooky Hay Rides at South Jersey Pumpkin Show accommodate large groups? How many people can experience Haunted Barn & Spooky Hay Rides at South Jersey Pumpkin Show together as a group? Yes of course, we are visited by thousands over the course of 3 days! Anything else you'd like to let us know about Haunted Barn & Spooky Hay Rides at South Jersey Pumpkin Show? Portions of the proceeds are donated to non-profits and the ScottRWBaileyFund. The fund is an educational scholarship for a student each year heading to Cumberland County College. The South Jersey Pumpkin Show will always be held in memory of my October son, Scott Bailey, who passed away after an ATV accident May 2010.